Fixes directly to the secondary structure by means of Pilkington Planar™ spring plate brackets or castings. The 902 can accommodate any angle of slope - making it ideal for roofs and canopies. This is the most popular Pilkington Planar™ fitting which eliminates the need for spring plates and allows absorption of live loads and thermal expansion by rotation round a steel pin connected to the back-up structure. 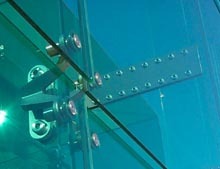 The fitting can also be articulated to allow use in facetted façades. Pilkington Architectural engineers are on hand to cater for the needs of the most bespoke project, whether the requirement be custom spring plates or glass supporting bolts. The ability to customise the form and function of existing fittings enables the specification of a wide range of glass in almost any application.